​..our work looks that good. DO YOU NEED KITCHEN CABINET PAINTING? IT'S A GREAT WAY TO SAVE A BUNDLE ON RENOVATIONS! Painting Cabinets and other redecorating plans. We don't just paint cupboards and cabinets in the bathroom and kitchen, we apply lasting acrylic finishes that will make you delighted that you chose to save money on new cabinets. We create custom finishes and looks that will make refinishing the rest of your room easy! Imagine choosing from almost any color in the rainbow. People choose to reface kitchen cabinets because the cost is so much less than new and the look is great. ​Colorado's Kitchen Cabinet painting. We work quickly, and carefully. ​The way we work is quickly, and carefully. 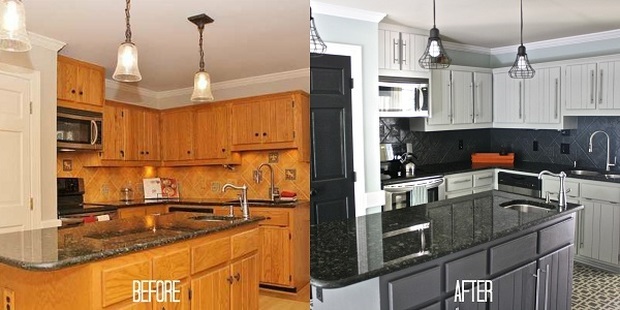 The final look of cabinet painting should look as good as replacing your current cabinets with new fixtures. Making it look brand new depends somewhat on the condition of the existing cabinets but we find that they are usually clean enough to deliver the custom finish you are looking for. Kitchen cabinet refinishing is a skilled scope of work, and requires detailed preparation and precise planning. Too much warping or wear and tear on the target cabinets, doors and drawers, and it becomes difficult to guarantee the final work; so we ensure that in order to get that pristine finish you are expecting, we make sure that the surfaces are ready to be refinished. The doors and panels are carefully removed and stacked, we transport them to our finishing studio where they are prepped and sprayed with your custom finish. Cabinet frames and frontage areas that are exposed will be professionally finished on location and will include any repairs deemed necessary. We usually leave shelves alone but that option is available. Pro Painters does not take shortcuts, our finished work passes close inspection by us before we are satisfied with the work. Spray painting with precision and accuracy comes with tons of practice. We have years of experience and are able to do the job to exacting standards. Our standard procedure when we show up to paint. Finally, Pro Painters performs a complete clean up. Thinking of remodeling the kitchen? Cabinets are usually very expensive to replace and the time needed to renovate may be somewhat crushing. It's really hard to be without a kitchen for an extended period of time. Most types of cabinet woods are acceptable for refacing including pine, oak maple, and most melamine finished facings can be done as well. We can paint most cabinet surfaces we are faced with and will give you the amazing new look you were anticipating. Bathrooms can be approached in the same manner; no problem to upgrade those tired cabinets by repainting them and all the while, saving a pile of dough. If you have been looking into renovations involving bathroom or kitchen cabinets, you have likely discovered that the most popular room to renovate is the kitchen, then the bathroom next. But they are also the most expensive, certainly on a foot by foot basis. So, with expense in mind, if you have decided to that it's time to update your kitchen since you have grown weary of the look, let's face it, we spend most of our time in the kitchen so it keeping it looking fresh and new is very important. Functionality may not be working as you would like, that can also be a sign that it's time to think about change. One of the major costs involved in kitchen upgrades is new cabinets. You should definitely be looking at repainting and updating through a new custom finish along with new updated hardware such as hinges and knobs. The savings you can effect by kitchen cabinet refacing will go a long way to lowering the overall cost when including the renovation of counters, floors and back-splash to your expectations. We always make ourselves available for in-home consultation; we work with you to ensure you are knowledgeable in your efforts, we will share our experience and show you products that will make your cabinets jump out and change how you feel about the old kitchen. Remember that studies have shown that kitchen and bathrooms are two rooms where you can expect to see the best returns on renovation dollars spent, you can expect a very decent return on your renovation decision. With professional painting, and with custom hardware, you can get what you want at a fraction of the cost. This compact process will likely take about one week or so, but the good news your kitchen remains operable.